If you've read Welcome to Nowhere, you'll know that Omar and his family have had a really hard time, having to run away from their home in Syria and escape into Jordan. They've managed to make a go of life in Za'atari refugee camp, but it certainly hasn't been easy. The awful thing is that there are millions of Syrians like Omar and Musa who have had to flee, leaving everything behind them. They've gone to Turkey, Lebanon and Jordan, and some have been brave enough to risk the dangerous journey to Europe. There are more than a million Syrians now in Jordan, but only 20% of them live in the refugee camps. It's hard enough for them, but even worse for most of the refugees who live outside. In the camps, there are at least cabins for people to live in, as well as schools and hospitals. Outside, there's practically no help for refugees and they have to manage on their own, with no money and no chance to work. It's worst of all for the children. Most Syrian kids in Jordan have no schools to go to. They're missing their chance in life, and with no education it's going to be really tough for them in the future. The Jordanian people have been heroic in the help they've given the refugees in their country. Now, one in five people in Jordan is a refugee. If that was true in the UK, there would be 5,000,000 extra people here. But it's tough for the Jordanians. Their country is not rich, and they need help from the rest of the world too. There's a small British charity called The Mandala Trust (www.mandalatrust.org) which is run by volunteers and so has no administrative costs. All the money they raise goes to the schools around the world that they support. And now they're supporting two schools in Jordan that have been opened specially for refugee children: the Hope School, and the Azraq Community School. The teachers in these schools are refugees themselves, trained and qualified before they too had to run away from Syria, so they understand the children, and can help them catch up with the years of school they've lost. This school is near Amman, in a house that's being adapted, and it opened in September 2016. So far, it's taken in 75 children, from kindergarten to Primary Four. If the school can raise enough money, they'll start IT and English classes for older children in the afternoon. The school is helping the mums and dads too, who feel at last that they and their children have something to hope for. There are so many things the school needs! The library needs books, the children need pencils, crayons and paper, the classrooms need desks, chairs and whiteboards, and of course the teachers need to be paid. Find out how you can help here (downloadable PDF). the lovely new azraq community school opens! Up in the desert landscape of Northern Jordan, near the Syrian border, there are lots of refugees who are living in really tough conditions. The Mandala Trust has helped with funds to open a brand new school for children who have lost years of education and who had been having to learn in cramped tents. These children have so many problems! Many of them have lost their mums or their dads as well as their homes in Syria. They've seen things that no child should have to see. They've been hungry, frightened, and very cold in the winter. But they can feel safe in this new school. The teachers here will understand if they feel angry, or can't easily sit still. They will help the children build their confidence. They'll give them a safe, caring place where they can start to forget the past and begin to learn again. But there are so many things the school needs – books, paper, pencils, whiteboards, practical things like toilets and, of course, salaries for the teachers. In the first picture you can see a boy holding a donated schoolbag. He's very proud of it. Inside it are books, pencils, notebooks and all the things he needs. The cost of a bag full of supplies like this is £10. You see the two little boys sitting on boxes? They're food boxes given to refugee families who are struggling to survive. £25 provides the basics for one month, with things like rice, cooking oil, flour, cans of tomatoes, tea, sugar, pasta and cheese. 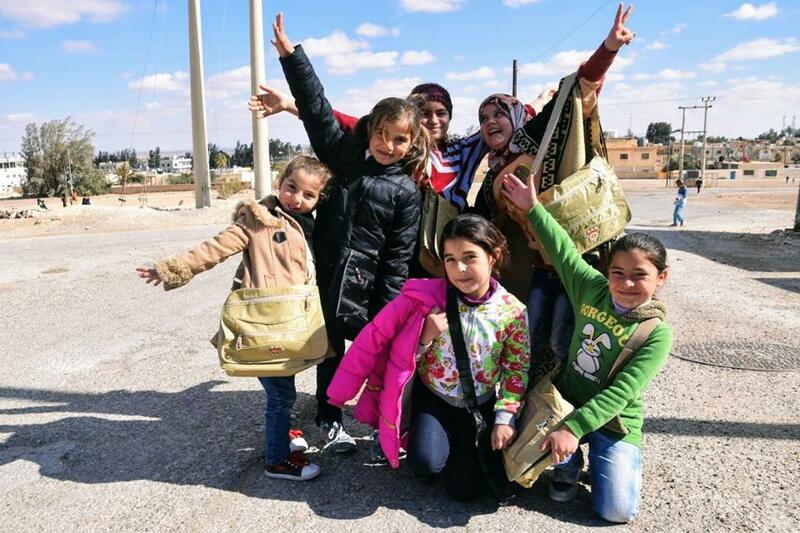 If you feel inspired to raise some money for the Azraq Community School, contact the Mandala Trust, who will be able to send the money directly to Jordan. How about holding a bake sale? What about a sponsored Readathon? Can you think of something that people might sponsor you to do? Over to you for ideas! I'd love to hear about your fundraising efforts. Email me through my agent at hd-office@theagency.co.uk to let me know how you're getting on, and I'll make sure you get a big thank you on the NEWS page of my website.